OnoTech: Ethan Stock on Technology: Airlines vs. Fuel Costs = Dirigibles? Airlines vs. Fuel Costs = Dirigibles? I just read a fascinating article in the New York Times about Boeing, Airbus, and the future of commercial aviation. Boeing, as airplane geeks will know, has bet heavily on the 787 'Dreamliner', a highly fuel-efficient midsize plane designed to serve point-to-point international routes -- San Francisco to Shanghai, Athens to Boston. Airbus, on the other hand, is building the massive A380, a plane designed to carry 500+ passengers on core 'hub and spoke' routes such as New York to Tokyo, with smaller planes serving as 'feeders' to these routes. Fuel cost vs. customer happiness. As recently as 12 months ago, I would argue with friends about 'peak oil' and what an economy looks like as it slides down the back side of a bell curve of production; and I would get signficant pushback that we were anywhere close to such a circumstance. The more libertarian-minded were fond of citing the famous Simon-Ehrlich bet on commodities as a supporting point. And here we are. Massively rising demand for oil from China and India; potential disruption of significant sources of production ranging from Venezuela and Bolivia, Nigeria and Sudan, Iraq and Iran, to the Khazak basin in the former Soviet Union. No massive new sources of oil discovered, and few likely to come on line soon. And wild cards such as the Canadian tar sands are predicated on... high oil prices to make them relatively cost-efficient to produce. Which got me to thinking: If the tradeoff for airlines is fuel efficiency vs. customer satisfaction, why not dirigibles or blimps? Right now it takes about 10 hours to fly the 6000 miles from SF to London, at about 600 miles per hour. 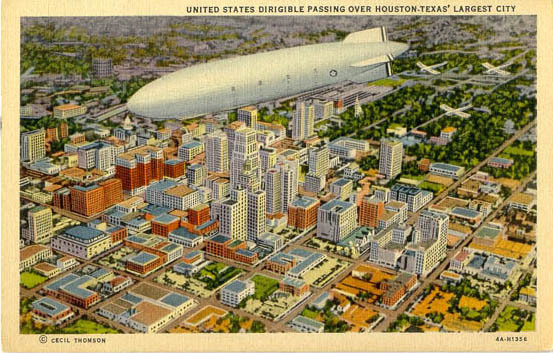 An appropriately designed dirigible could do it in 24 hours at 250 miles per hour, at a vastly (90%?) reduced fuel cost -- since a dirigible would benefit both from the cubic reduction in power-required vs. speed flown, and the absence of the need to expend power to keep the aircraft up in the air, which accounts for a large percentage of airplane fuel cost. Imagine that, instead of spending 10 hours on a cramped, noisy, EXPENSIVE airplane, you spent a full day and a full night on a quiet, spacious, dirigible? Broadband internet access would be essential -- not only could you make crystal-clear phone calls, but you could transfer any volume of data. You'd get nice meals from a large kitchen. You could walk around and exercise. You could sleep in a real bed. And in a world of $70 - $140 a barrel oil costs, all of this might be CHEAPER to provide than a miserable 10-hour flight. The key, of course, is making the experience as business-like for business travelers, and as vacation-like for vacation travelers, as possible. Without doing some considerable aeronautical math, I can't estimate at what fuel price point dirigibles would start to make sene. But it's certainly fascinating to consider.